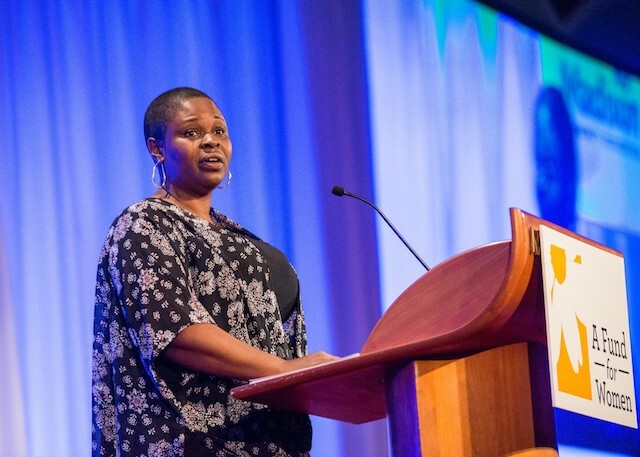 Sagashus Levingston, founder of Infamous Mothers, an organization helping black mothers share their experiences, spoke at the A Fund for Women’s Annual Dinner and fundraiser on October 12. A Fund for Women awarded $74,500 to Madison nonprofits in October. The organization, a partner of the Madison Community Foundation, announced the recipients of the award during an annual fundraiser on October 12. The award is designed to improve the lives of women of color, single mothers, and women who experience economic hardships. The four recipients include Latino Academy of Workforce Development, Onward Odyssey, Doyenne Group Evergreen Fund and YWeb Career Academy (YWCA). All are organizations involved in the Madison area that focus on uplifting women. “These nonprofits have already proven their effectiveness in strengthening the lives of women and girls, and we’re thrilled to support them in growing their impact,” A Fund for Women Board Chair Nicole Jenkins said. Requests from grant applicants in the 2017 cycle totaled $283,560 according to a press release, but A Fund for Women’s advisory board wanted to select a few applicants to fully fund rather than spreading out partial awards. Organizations receiving part of the $74,500 were given all requested funding. “A key takeaway from the decision-making process is that we need to grow our endowment fund if we want to increase our impact,” Jenkins said. Latino Academy of Workforce Development serves low-income or unemployed Latino adults, with the grant going to women in job training programs. Onward Odyssey is part of the UW Odyssey Project and will be using its funds to maintain courses in writing, special education, and others.YWCA prepares women and people of color for careers in technology, and the Evergreen Fund gives financial support to minority and women-run businesses.